THERE ARE 465 KMs OF TRAILS TO CLEAR BEFORE THE SNOW COMES AND WE NEED YOUR HELP! 100 volunteers x 8 hours = 800 hours needed to complete the work. November 5th and 6th: Meet at 8am at the Ritz Cafe for breakfast and assignments, lots of parking, bring ATV, saws, safety gear. Have a big strong teenager that enjoys the trails all winter? Bring them too! Pick up a buddy on the way! Let’s push to get it all done in one weekend. NOTE: If you do NOT have an ATV or a Chainsaw, we still need you! We’ll get you a ride and a job! See you there! 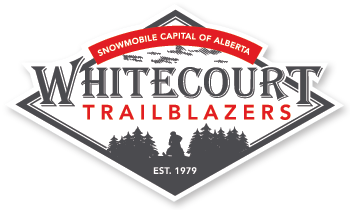 It’s going to be snowing before you know it, so the Whitecourt Trailblazers will be holding their monthly General Meeting on Wednesday, October 12th at 7:30 downstairs at the Whitecourt Legion. Please note the new location.